Notre Dame began its 2015 campaign in earnest this weekend with a pair of New York-area meets; the top-ranked Irish women went 8-2 over the two days while the No. 2-ranked men struggled, posting a 4-5 mark. The Irish competed on back-to-back days, first traveling to the St. John’s Invitational on Saturday before heading south to Jersey City, New Jersey, to compete in the NYU Invitational on Sunday. Sophomore epee John Pietrowicz lunges during the DeCicco Duals at Joyce Fieldhouse on Feb. 9. Saturday yielded mixed results for the Irish squad with the women’s team (13-2) posting a 4-1 record while the men’s squad (8-6) struggled to a record of 1-4 on the day. The men dropped their first three rounds before finally pulling out a 15-12 win against host squad St. John’s in the fourth round of the meet. They faltered once more in the fifth round, however, losing to Columbia 16-11. The women’s results proved far more favorable, winning the first four matches before dropping the final contest to Columbia by an 11-7 margin. The women found success in the foil matches and posted a 27-18 record over the course of the day with their only team loss coming against Columbia in a 6-3 decision. Their largest margin of victory on the weapon came against Penn State’s squad, where the Irish claimed a 7-2 decision. The men’s epee squad struggled throughout the day, falling in all five of their matches. Sunday’s meet proved to be a far more consistent outing for the Irish lineup as both teams recorded one-loss days. The women’s side continued their winning ways, claiming a 4-1 record on the day, while the men reversed the previous day’s trend, going 3-1 in the meet. The Irish were joined there by Yale, Columbia, Northwestern, St. John’s and NYU, however, the Wildcats did not field a men’s team. The women dispatched Yale by a healthy 22-5 margin to start the afternoon, but that success was followed by a tight, 14-13 defeat at the hands of a Columbia team that handed the Irish foil squad its first loss of the season. The women’s squad rallied to claim the final three bouts of the afternoon in wins against Northwestern, St. John’s and Columbia. The Irish men started the day strong on the strips with a 21-6 victory over Yale, posting even 7-2 victories in each weapon category. They followed this performance with a 17-10 win over Columbia before heading into a bye round. 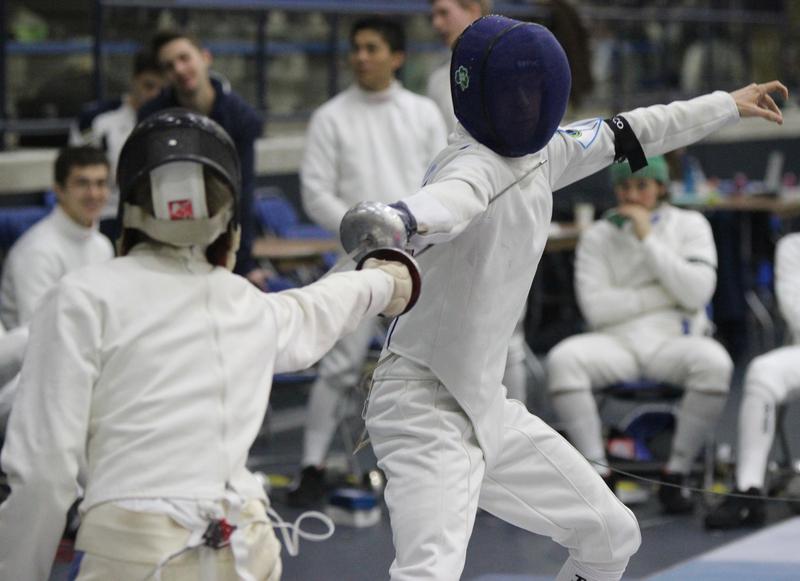 The Irish went 1-1 following the break, taking their only loss of the day against St. John’s before claiming a 19-8 victory against NYU where the Irish made up for a 4-5 loss in epee with 7-2 and 8-1 wins in foil and sabre, respectively. Notre Dame resumes its season this weekend at the Northwestern Duals in Evanston, Illinois. Team competing include Ohio State, Pennsylvania and Princeton, a trio of schools whose men’s and women’s teams are both in the top 10. ND finds success in N.Y.